Language matters when we write about education. If we want to have honest conversations about the topic, we should use honest words and phrases. Here are a few that, in Orwell’s words, should be sent to the dustbin where they belong. Education reform. I wrote an entire post on this in 2012. Reform doesn’t just mean change; it means change for the better. We shouldn’t use reform to refer to a set of policies – charter schools, vouchers, test-based accountability, etc. – that haven’t been proven effective. At-risk students. Journalists use this phrase to refer to children who are poor or who live in what are often called blighted neighborhoods. Unfortunately, some educators use it too. But what does it mean, really? At risk of what? Read this powerful essay by Jason Buell and you’ll think twice before putting a label on children. With no help from the policies the governor is promoting. There were a little over 600,000 students in A and B public schools in 2012, the first year for the current grading system. By this year the number had jumped to over 750,000. Schools have made more progress in two years than Pence thinks they should be making in the next six. Unveiling his 2015 legislative agenda last week, the governor lamented the fact that 100,000 of Indiana’s K-12 students attend schools with grades of D or F. That’s about 10 percent of students in public schools. Pence education plan: Olive branch or club? Gov. Mike Pence has got this feint-one-way-and-move-another business down to a science. Witness the education agenda that he unveiled yesterday, heading into the 2015 legislative session. The blockbuster news – the headline generator – was the announcement that Pence is disbanding the Center for Education and Career Innovation, the super-agency that he created 18 months ago. The Republican governor spun this as an olive branch to Democratic Superintendent of Public Instruction Glenda Ritz. Ritz heads the Indiana Department of Education, which CECI and the State Board of Education have been doing their best to elbow into irrelevance. “It is time to take the politics out of education in Indiana, or at least out of the State Board of Education, and get back to the business of investing in our schools in ways that prepare our kids for the future that awaits them,” Pence said. The State of Indiana took over the five “persistently failing” schools in 2011 and handed their operation over to charter school operators. How has that worked out? Four of the schools still got Fs in the 2013-14 school grades that were released this fall. One inched up to a D. This is after two full years of the turnaround operators being in charge and promising results. The state takeover was profoundly disruptive to children and to staff. In Indianapolis, lots of students initially left the schools. Turnaround operators reaped a windfall in state funding for children who no longer attended. For a time, they also picked up the lion’s share of School Improvement Grants. Even so, one of the turnaround operators, Tindley Accelerated Schools, is now bailing on its agreement to run Arlington High School, sending it back to Indianapolis Public Schools. Another, Edison Learning, appears to be emerging from a nasty fight with Gary Community Schools over who’s responsible for what at Roosevelt Academy. It looks a whole lot like the turnaround experiment, not the schools, has been a failure. But the State Board of Education’s response is to decide Indiana needs more state takeover, not less. Under current law, the state can take over a school after six consecutive years of F grades. Wednesday, the board proposed changing the law to allow takeover after four straight years of Ds or Fs. That just doesn’t seem to make a lot of sense. The Obama Administration’s proposal to rate and reward schools of education is just the latest salvo in America’s campaign to fix schools by improving the teaching profession. 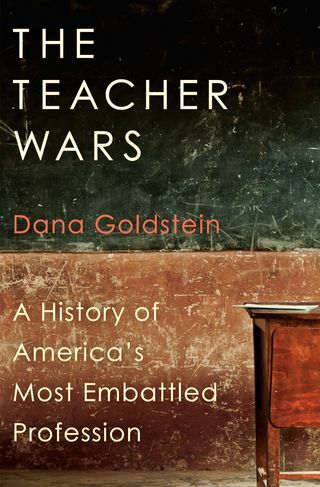 And as Dana Goldstein shows in her new book “The Teacher Wars,” this effort has been underway for a very long time. Starting with the common schools movement of the early to mid-1800s, teachers have been the focus of a great deal of our anxiety about national progress and our children’s future. We’ve debated the best ways to recruit, train, evaluate, reward and fire teachers. We’re as far from agreeing as ever. And in recent years – as often in our history – concern over bad teachers has becomes a “moral panic,” in which a small group comes to represent big societal concerns. How did it come about, Goldstein asks, that American teachers are “both resented and idealized” while countries like Finland and South Korea shower teachers with respect. Goldstein is a journalist whose reporting on education has appeared in the Atlantic, the Nation, Slate and elsewhere. (She is now part of The Marshall Project, a nonprofit media organization covering criminal justice). She has a journalist’s sense of story and character. She understands that you write about individual soldiers, not the entire army. And the history of the teacher wars is rich with fascinating combatants, from the Civil War-era African-American educator Charlotte Forten to the Chicago labor pioneer Maggie Haley to the sometimes confrontational and often unpredictable union leader Albert Shanker.